Take an inside look at Area 51, a.k.a. Dreamland, the world's most famous secret Air Base. For 20 years and counting Dreamland Resort has been the most comprehensive source of information about Area 51, Black Projects, the Nellis Ranges, TTR and the ET Highway. The owner is a 20-year Area 51 Research veteran and a resident of Rachel, NV, right outside the gates of Area 51. Great gift idea and collectors item: Our popular Area 51 Patches and Decals are available exclusively in our online store. Dreamland Resort Exclusive: 2011 Area 51 Satellite Image!!! 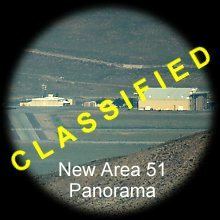 Click here for new satellite images of Area 51, taken Tuesday, August 23, 2011. They show several current construction projects and road improvements at Area 51. This Dreamland Resort exclusive is clear evidence that the Groom Lake base continues to expand to be ready for the Black Projects of tomorrow. We need your help to keep the Dreamland Resort online. If you like the Dreamland Resort web site please help us keep it online. How can you help? Link to us. Click here to see our banners that are free to use.